The SOTER RS operator interface experience is uniquely enhanced by exclusive “Touch-Screen” functionality, offering greater image manipulation and interrogation. Your staff will appreciate the ease of use and the familiar technology interface, similar to Smartphones and Tablets. The entire scanning process takes about 10 seconds. During that period, an X-ray image is generated that shows the entire body and all contraband that may be hidden. 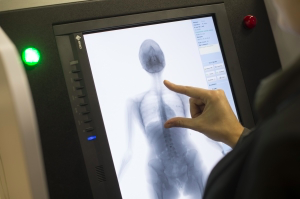 Operators are exposed no absolutely no radiation during the scanning process, making it safe for your staff and more effective than ever before. We offer the smallest radiation footprint available in the market, with no radiation risk to the operator through a unique design, scanning process, safety zone and an X-ray Tube that is only active during our 8-10 seconds scanning process. Radiation exposures for prisoners or others scanned with the SOTER RS is extremely low. In fact, it is lower than many common procedures and daily exposures that people receive in the normal course of a day. The SOTER RS utilizes Transmission Image Technology to balance the greatest possible detection with the least invasive image type.